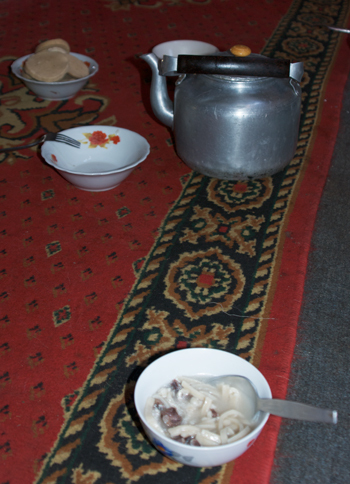 One of the interesting and, to a lot of Westerners, amazing things about traveling in Mongolia is that the thousand-plus year old traditions of hospitality out in the countryside are still practiced. It feels very odd to walk up to someone’s ger (assuming there are no dogs in sight), open the door and walk right in without knocking. After four trips, I still get a twinge doing it. I found myself very intimidated the first time. There are no windows in a ger and the door is solid wood so, even with a guide, you are walking into someone’s home without any idea of what to expect. Fortunately, the Mongols are patient and understanding, like my first time, when I turned to the right instead of the left and circumnavigated the ger to get to the stool that I was to sit on. At least I remembered not to step on the threshold or walk between the upright supports. The older gentleman approved of the fact that I was wearing Mongol boots. 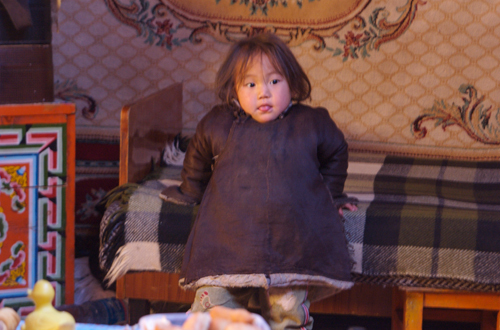 He said to me, through my guide “I see Mongol boots and I look up and see… a western face”. It was spring, which means really cold and windy, and they were the warmest footwear I had with me, having purchased them at the State Department Store in UB. They worked, of course. 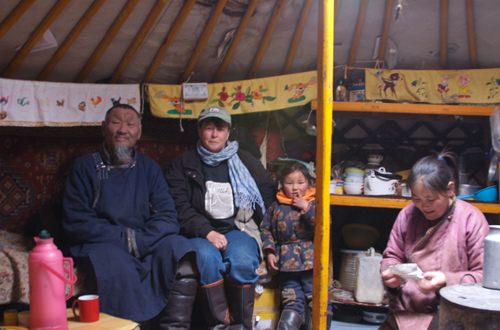 I asked if he would be willing to have his picture taken with a westerner wearing Mongol boots and he immediately sat up, buttoned his del and made room for me to sit beside him on the bed. Those thermoses keep water hot, hot, hot for over 24 hours. I want one. I just have to figure out how to carry it home. Now ger visits are one of the things I MOST look forward to when I go to Mongolia. A ger, maybe because of the quality of space that the round shape creates, is one of the most pleasant and peaceful places that I’ve ever been in. 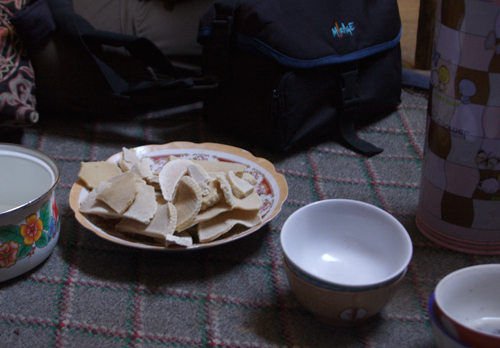 I just happily sit sipping milk tea or airag and nibbling aruul as conversations that I don’t understand a word of go back and forth between my guide and our hosts. 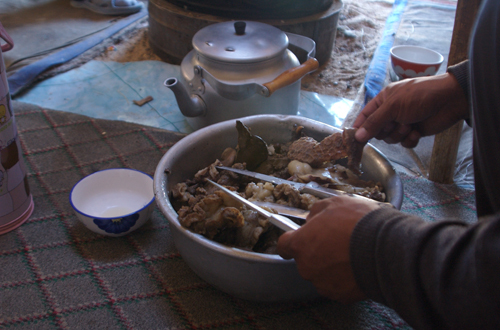 Especially those animal intestinal parts and whole organs (ones in the big bowl) have rich minerals and vitamins that whole central asian nations or nomads ate them for at least few thousands of years. I heard Americans began to eat them as well due to korean and chinese culinary influences in the states. I appreciate your article very much. 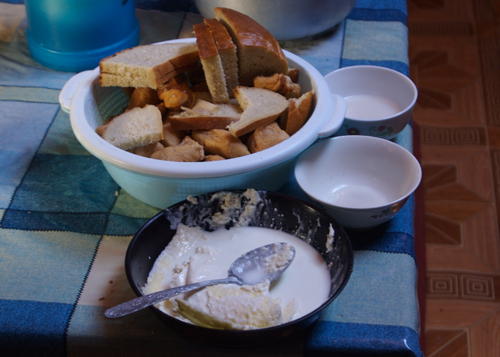 I would like to add one more thing to the Mongolian nomad’s hospitality – I believe it is sheer compassion (no expectation of balance and compensation factor here, I must say) It is the only place where hosts care and give to strangers without expecting anything in return; knowing perfectly that they might never see them again. It is the nomad outlook in life – a common norm how nomads regulate person’s behaviour as being good – the following could sum up what I experienced in the stepps. (I lived there for two years). I never heard anything close to it apart from the Mongolian nomadic community. summary: … … Keep on dreamin…g, trusting, sharing and caring without calculating and expecting anything in return -the sign of true friendship. Thank you both, Barimalch and Shurengoa, for taking the time to comment on my post. I’ve passed on the big bowls of mutton parts because I know that there are antibodies that I don’t have and I don’t want to get food poisoning. That doesn’t mean that I think there is anything wrong with it. Americans keep all meat refrigerated, partly because it is more humid here than in Mongolia. I really like mutton, which we can’t get here. Just lamb. I will keep on dreaming, trusting, sharing and caring and I have found true friendships in Mongolia. The Mongols have much good to teach the rest of the world. Thank you for sharing. 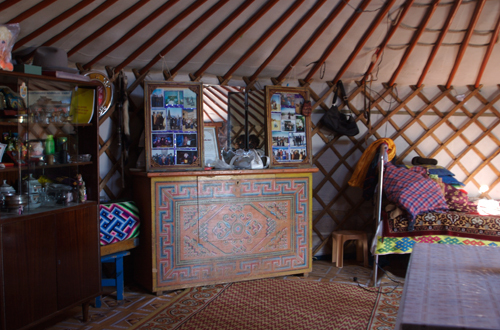 Hi, I’ve got into the habit of calling my yurt, a yurt, and not a ger. How much of a faux pas would this be if mentioned in polite Mongol company? Also, may I pick your brains on the day to day living in a ger? I’m intending on spending a fair bit of time in mine and would appreciate a headstart from someone who has spent time with people who have been in them for millennia. Not a big faux pas because I think people hear it all the time from visitors. But definitely points for saying “ger”, which is pronounced roughly ger as in “gery” without the “y”. What I’ve seen in the gers I’ve visited is that the layout is the same in all of them. Stove in the middle between the upright supports. Almost a taboo to walk between the supports, which I think is a way to teach and keep children from burning themselves on a hot stove. Cabinets that form an altar or a place to put family photos, etc. on the north side. Door always facing south because that’s where the wind comes from in the winter. Beds on the east and west sides. Kitchen along the wall between the door and east side bed. Everything is portable. I’ve watched meals prepared and the cooks can practically do everything sitting on a stool because they’ve got most of what they will need within arm’s reach. There is no indoor plumbing. Water is kept in a large plastic container near the door and scooped out as needed. All personal possessions are either stored in cabinets or under the beds. Papers and other items are often tucked up between the roof poles and the felt. Very handy. The women tend to have their toiletries in what resemble those travel toiletry holders that hang vertically and keep them next to the door. Hope this helps. Feel free to ask any further questions! And my Mongol readers are also invited to leave comments. Thank you for that, much appreciated. I can totally see the logic in having a decent thermos, so much so that I bought a top of the range Thermos steel one today for my yurt. Logic being that there’s no point boiling water all day just for a cup of tea, just boil 2 litres in the morning, stick it in the flask and use it all day, it’s there, it’s ready to go straight away!